The long-term goal of the project is to expand organic strawberry production in the Southeast by developing organic strawberry cropping systems that are more environmentally and economically sustainable and resilient to weed, pest, and disease pressure. We established our project team in 2015 and initiated field trials in April 2016. During the first year, we hosted a research assessment with growers and technical advisors and held our first Industry Liaison Panel meeting. In year two, the project team began on-farm trials that are grower designed and conducted. These trials are not replicates of on-station trials. The growers select which of the on-station treatments or combinations of treatments they want to test on their farms and then implement their own management practices in the trails, including harvesting and recording yield by treatment. 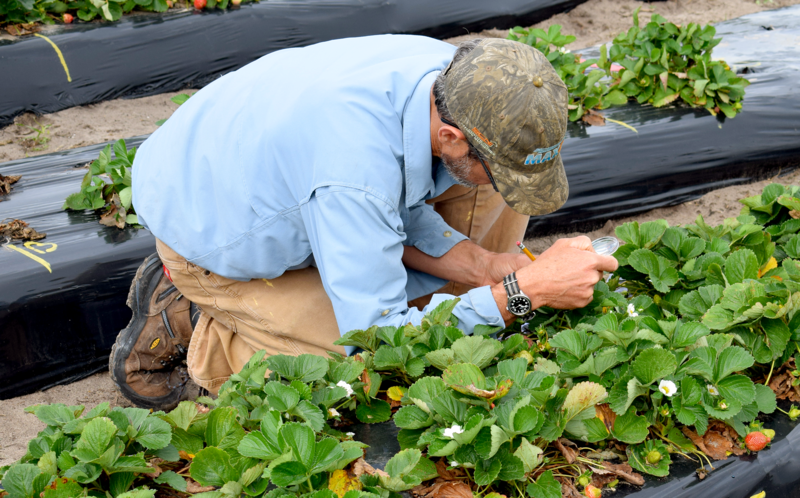 This type of on-farm trial greatly enhances the value of the on-station research because it exposes the treatments to a greater range of soil types, other bio]o=physical traits, and management regimes that are representative of strawberry production. We are also intensively interacting with the farmers during the on-farm experimentation process in order to understand how they make management decisions, the factors that weigh into the decision-making process and how they balance different demands on scarce resources, like labor, and deal with unanticipated risks like inclement weather. In 2018, we will continue the on-farm trials, conduct two independent research assessments with growers and service providers, and prepare web-based materials for our project website.